LiveStatistics allows investors to define an event based on different parameters. LiveStatistics will identify in real-time how often similar events occurred in the past. All these past events are analyzed in real-time. 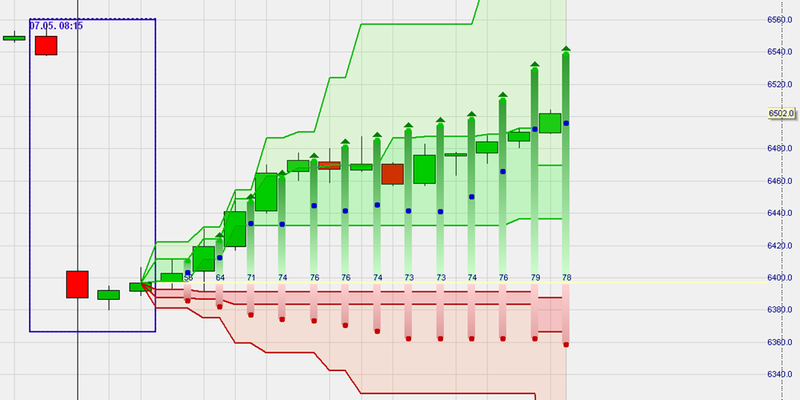 Based on the price developments of the past events, projections for the current market price are displayed in the chart. The user defines an event based on a set of parameters (shape, trading range …). LiveStatistics identifies all similar events in the past. LiveStatistics displays projections for the current market price in the chart. 1. WHAT HAPPENED IN THE PAST? The example above illustrates a classic trader question: to buy or not to buy? Buy because it is a strong, consistent rally which is simply taking a pause. Don’t buy because this rally has run out of steam and the market was very negative after the opening. Both are valid opinions. But … what happened in the past when similar events occured? LiveStatistics displays projections for the current market price in the chart. In the example above the statistics show a bullish bias. This example is dealt with in detail in the free LiveStatistics guide. A "reality check". The projections are a good indication of how the market price can move over a given period of time. Many investors have price expectations which are not realistic. Determining stops and price targets. These levels are visible in the chart. Confirming a signal given by a strategy. If, for example, a strategy gives a buy signal, the live statistical data should show a bullish sentiment. Trading strategies based on live statistical data. The example above illustrates another classic trader question: will this gap close or not? The projections based on statistical data seems to have a bullish bias. The real evolution of the market price is shown next to the LiveStatistics projections. The gap did indeed close later that day. The respected finance magazine "€uro am Sonntag" tested 13 CFD-Forex broker on 733 criteria. In this wide-ranging test of the brokerage industry broker WH SELFINVEST came in first, once more. Try a few trading strategies... download a real-time NanoTrader Full demo.